In the category of breakfasts that verge on desserts, chia seed pudding is one of the healthiest options, if you can get past its slightly odd quality. When I think of chia, I inevitably think of Chia Pets (ch-ch-ch-chia!). But it turns out that, in addition to sprouting verdant faux-fur, the seeds are a good source of fiber, omega-3, calcium, antioxidants, and protein. Ancient Aztecs and Mayans used to eat them for their "magical" energy-boosting properties. Also, because the seeds absorb about ten times their weight in water, they're a perfect thickening agent for a nutrition-packed pudding. I tried making my first batch of chia seed pudding this weekend, and I was surprised at how simple it was to prepare: just mix together the ingredients and refrigerate overnight. It's difficult to describe the texture -- it bears a faint resemblance to tapioca, with a little more crunch. After a few bites, I was hooked. I followed this Food Network recipe almost exactly, though I'd recommend halving or eliminating the maple syrup at the end; in-season strawberries are sweet enough! 1) Whisk the almond milk, yogurt, maple syrup, vanilla extract, and salt in a bowl. 2) Whisk in the chia seeds. 3) Let the mixture stand for 30 minutes. 4) Give the mixture a quick stir and refrigerate overnight. 6) Spoon the pudding into containers and top with the strawberries. The recipe serves 2-4; from my experience, it made a hearty breakfast for two, with no leftovers to spare. 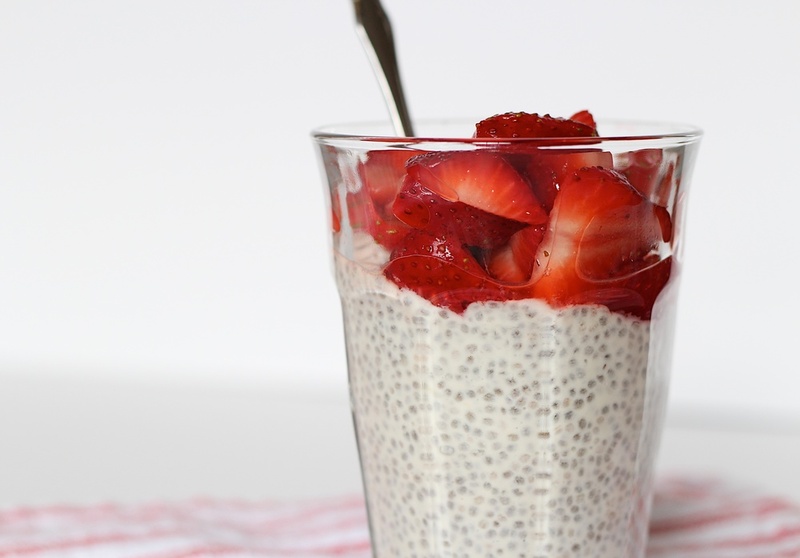 There are plenty of chia seed pudding recipes out there, so experiment away.